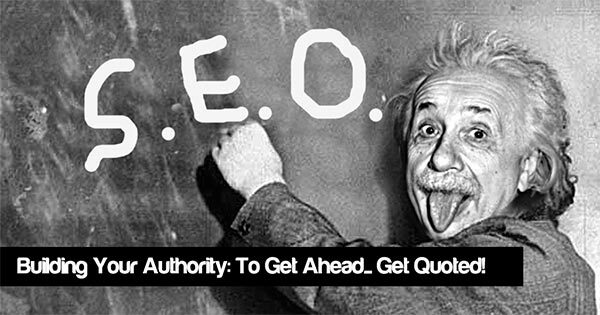 If you are a regular reader of internet marketing/SEO blogs, you’ll see that word popping up a lot; become an authority, build your authority, authority this, authority that. The thing is, once you become a recognised authority in your niche everything else falls into place. Link building becomes easier (in fact you probably won’t have to actually ‘build’ any links), people will be falling over themselves to share your content, you’ll get companies throwing free products (or cold hard cash) your way just for a mention, you’ll be able to eat unlimited rice pudding. Ok, maybe not the last one, but you get the idea. How the hell do you become an authority? Well, back in 2007, copyblogger (the authority on becoming an authority…) told us that the first step (in fact 50% of it) is to act as an authority. Speak to your audience with authority and you will, over time, become an authority. Unfortunately it doesn’t quite work like that. You see, the big problem there is the bit about ‘speaking to your audience’, which if you are just starting out will probably consist of your mum and your cat. Your cat will probably recognise you as the authority on catnip and tummy tickles, but that’s not going to make you a millionaire. The truth is that unless you are really lucky (or truly exceptional) what you do on your site is probably (at most) only about 30% of what goes into making you an authority in your space. So what’s that other 70% made up of? Well, you may have guessed already, but it’s all about building connections, building your traffic and most importantly building that audience. And one of the best ways to build your audience is to tap into the audience of other authorities. Guest blogging still works *but…. close to 50% said in 2013 that guest blogging was their staple tactic, in 2014 fewer than 15% listed it as one of their staple activities. That’s not to say you shouldn’t be using guest blogging to expand your reach – you should – just choose your prospects wisely. So what’s the best way to get yourself in front of prospective new followers in 2014? Well, if you want to get ahead… get quoted! Expert roundups (or group interviews) are hot at the moment and for good reason – they are very much a win-win. The contributors – they get their face and words of wisdom in front of a new audience. The host site – gets to tap into the brain power of a number of experts to give a broader insight on a topic. They will also normally benefit from the contributors helping to share out the post once it is live. If you are already an A list blogger your inbox will probably be flooded with requests for comments/insight, but when you are trying to make a name for yourself, opportunities to share your words of wisdom will be harder to come by. In my recent guide to white hat link building (which is an expert roundup of sorts) Rand Fishkin mentioned that interviews ‘beget more interviews’, so once the ball is rolling and your name starts to pop up then you will get more requests. But how do you get the snowball to start rolling down the hill? There are several cool features (and Ann promises many more to come), but the one that I am most excited about is the ‘Interviews’ section, which gives you the opportunity to either host or participate in expert roundups/group interviews. Registration is free and once registered you can start browsing group interview opportunities and submitting your answers. Don’t go crazy though and you should only be contributing if you have something genuinely insightful to add – the service will be heavily moderated. Also, remember that this is all about building your authority and your reputation. To quote The Social Network ‘The internet is written in ink’ so take the time to ensure your contributions are well written, professional and a good reflection of you/your business. This isn’t about picking up an easy backlink, it’s about establishing yourself as an expert. Q. Which feature of myblogu are you most excited about and why? For me the Interview feature is the most exciting. It is totally awesome. I can gather opinions from experts in any subject and then import those opinions into my blog very easily. But, that’s just the start; the follow-up Twitter chat and ViralContentBuzz.com promotions are like icing AND cherries on the cake. Participants in the chat gain credibility and social shares, I gain credibility by being linked with these experts and the blog post the interview is embedded in has a great chance of going viral. Like it or not, content curation is HOT! This feature is going to be much-imitated, but this is the first time I have seen it in operation. So far I am really excited about the Interview feature. I submitted an interview last week and have had some excellent responses thus far. I also provided answers to another one (besides this one) and feel that it is really great for us all to be able to help each other. Interviews like this are especially interesting to me because they do not require participants to spend a huge amount of time answering, they will allow for honest and well-thought out answers, and no one is put “on the spot”. I can see this feature helping me greatly in future articles, just like the one I submitted recently. The power and potential of MyBlogU Interviews is being demonstrated right now. 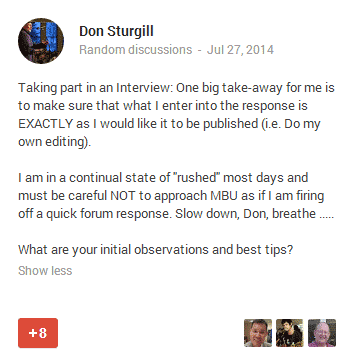 Not only do those with expertise come to me when I take advantage of the MyBlogU tool … many of those who respond are folks I would not have known to contact in the first place. We are working to let publishers easily generate “About the participating experts” section that could collect all the social media info of the contributors and put it together into a handy chart giving contributors more exposure. We’ll also teach our editor to generate the clickable “Table of contents” (something like you see here), since group interviews tend to be long and those work great for both usability and SEO (search engines may use those for mini-sitelinks). All in all, we are seeking to connect experts to bloggers while giving contributors more and more branding and social media benefits in exchange to their efforts. I think MyBlogU is an excellent idea to help people collaborate on group projects and brainstorm ideas with other smart marketers. I am really excited by the ability to source group interviews without having to email a million people and hopefully getting a few different contributors to these type of group interviews. Lately I keep seeing the same people popping up over and over again and while most of these people have solid advice it is always good to get different voices in the mix especially from bright up and coming IMers. Also looking forward to contributing where I can to help build my own reputation within the industry while helping out others. The main idea behind MyBlogU is just clever, original and inventive! In one word : ingenious! Browsing among several topics and choosing the ones that catch your attention is just great. This saves a lot of your valuable time! You have the opportunity to be featured as expert in your field, together with awesome other powerful people. It’s not only about getting traffic to your blog, but also having the chance to build strong relationships and new connections within your niche! I am so excited to learn more about the Twitter chats. I’ve always believed in the power of social media, but Twitter is my favorite one since when I started blogging. Also, the free promotion at ViralContentBuzz is a big plus. Basically, you have just benefits from joining MyBlogU! The interview section that we are both using now is probably the most exciting feature, being able to connect with other bloggers and get links is a win-win situation. I look forward to seeing my name start to crop up on other blogs if my answers get accepted. It’s also fun to answer peoples questions as you feel you are actually contributing something of value. It’s actually quite hard to easily find other bloggers views on a topic, usually you’d have to search through their blog or book to try and find a snippet that matches the point you are trying to make or help explain. 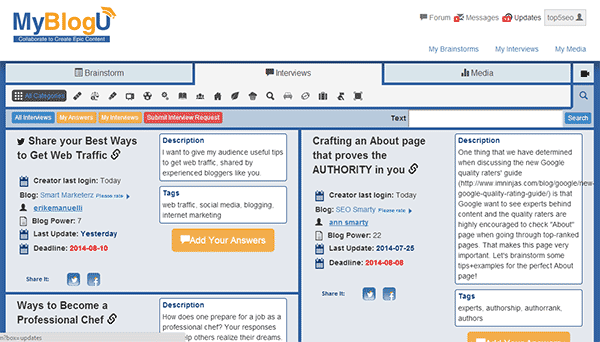 The interview feature on MyBlogU cuts all that out and connects you directly with someone elses thoughts and views. What really attracted me to this MyBlogU was the ability to access so many enthusiastic bloggers and work on ideas together in an open environment. The leverage this gives you is amazing, because not only can you get people to participate who you would never normally meet, but you do it without having to find the people manually, and manage the email ping pong yourself. This is a great time saver. It also allows a fantastic sharing of knowledge that normally does not take place so easily. MyBlogU also has such a variety of people, with a wide range of experience and niches which adds to the benefits. What a great way to meet new people and help each other out too! You will be on your way to establishing yourself as an authority in your niche and will quickly start to pick up other interview requests. As an example, I recently did an interview on Stuart from niche hacks’ blog and since it was published this week have had another 3 interview requests. Being interviewed (either as part of a group or individually) is probably the best way to build your authority in 2014 and a clean way to pick up strong links to your site. If you have any questions on group interviews or MyBlogU then please leave a comment below and don’t forget to sign up to MyBlogU for free here to start building your authority and getting quoted! thanks for having me on the blog. Great to be featured in the interview! The power of MyBlogU indeed. That you have had interviews as a result of this kind of thing is very encouraging, such things normally take years of work and leverage of a big social media following! No worries Ashley, thanks for your input! Authority, what every serious blogger wants! Once you become an authoritative blogger everything is much easier, like making good money online, having the content shared, gaining new followers, etc. With new tools like MyBlogU this is no longer a utopia and you can really do it with the proper efforts. Share your knowledge and select the topics you are more expert in, and you will be right on your way to build your authority online. Thanks for including me, David! No worries Erik, thanks for contributing. Really excited to see where MyBlogU goes, think it’s going to be great! awesome post, im looking to become an authority on Google Plus and other social sites hence my complete guide and guides on Circloscope and other social media elements. Google plus seems to be the site to use to build authority and rank by posting quality. Good luck Dexter, sounds like you are heading the right way! David, thanks SO much for putting this together! This looks just awesome and gives us a great asset to refer to when talking about the power of MyBlogU! No worries… you are not alone! Really great article! Thanks for including my input 🙂 It’s awesome to see the MyBlogU interviews live! No problem Sandy, thanks for contributing! I have never heard of MyBlogU, will try to visit and probably sign up. From my experience on blogging, building authority works best if you simply focus on a niche, build a strong social network and keep on pumping out interesting content. Good read and very valuable information. And I am certain that even a lot of people who know about the update will cry when it happens.